Posted in: Journal Club. Tagged: exoplanets, interstellar exploration, Proxima Centauri. Very neat paper this week from René Heller and Michael Hippke exploring the exploration of the recently discovered planetary system around Proxima Centauri. Proxima Centauri is the closest star to the Earth (only 4 lightyears away), and last year, an Earth-sized planet was found around it, opening to door to the very real possibility of a mission to an exoplanet. After the planet’s discovery, the Breakthrough Starshot project proposed using solar sails and lasers to accelerate a tiny spacecraft to the system. Weighing only a few grams, the spacecraft could be accelerated to 20% the speed of light, giving a travel time to the system of about 20 years. Of course, the drawback to such a short trip is that the spacecraft would quickly zip past the planet, so the mission would have only seconds to collect data. Building on that idea, Heller and Hippke pointed out that, as long as you didn’t mind waiting a little longer to get there (about 100 years), you could send the spacecraft at a low enough velocity that the solar sail could be used to slow the spacecraft on the other end. That would give you years to collect data, instead of seconds. Key to their solution is the idea that you could slowly turn the solar sail, similar to tacking in the wind, to optimally slow and steer your 10-gram spacecraft. The animation below shows the basic idea. With such a small spacecraft, there wouldn’t be a lot of room for moving parts to turn and orient the solar sail. 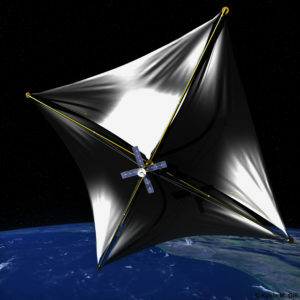 To solve this problem, Heller and Hippke suggest the sail could be made of nanocrystals-in-glass whose reflective properties could be tuned to torque the spacecraft using the stellar photons themselves. Of course, there are still zillions of technical problems to solve for such a mission (not to mention the difficulties of obtaining centuries-long NASA funding), but this study adds one more piece to the growing possibility of interstellar exploration.